Shift the ape and Puzzle the donkey find a lion skin in the Caldron Pool of Narnia. They use the lion skin to disguise Puzzle as Aslan, the great lion. 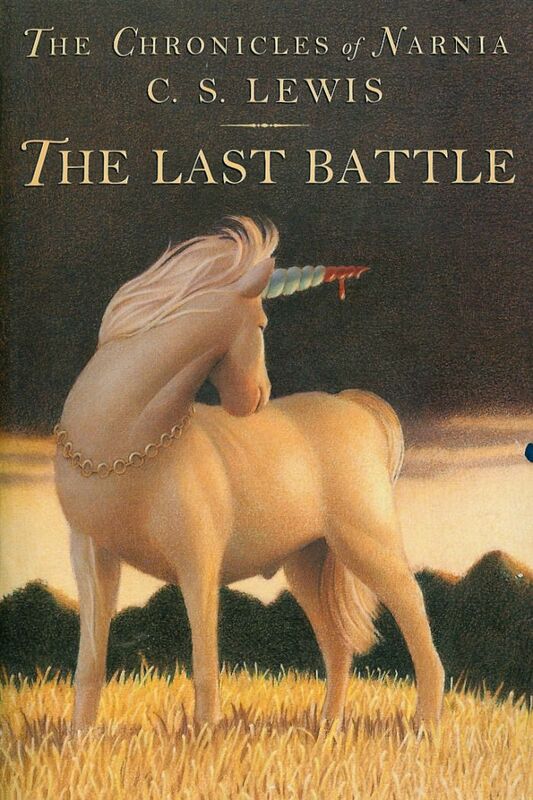 Meanwhile, Roonwit the centaur warns King Tirian, the king of Narnia, that the peace in Narnia will be broken soon, and Aslan has not actually come to Narnia. Shift uses Puzzle, disguised as Aslan, to convince the talking animals and the dwarves to cut down the trees of Lantern Waste to sell to the Calormenes, people from another land. Setting off to Lantern Waste, King Tirian and his steed, Jewel the unicorn, hope to defraud the fake Aslan and stop the cutting of the trees. After slaying two Calormenes for abusing a Narnian horse, King Tirian feels guilt and turns himself in to the remaining Calormenes, as he is vastly outnumbered. He requests an audience with the supposed Aslan, but is turned down. The lie that Puzzle is Aslan is reinforced, with King Tirian unable to act. Later that night, King Tirian has a dream about the seven friends of Narnia from England. Soon after, Eustace Scrubb and Jill Pole, two of the children from the dream, appear to help King Tirian. They assist him in freeing his steed and uncovering the lie that Shift had put into place. The dwarves that learn the truth are disbelieving in Aslan, save for one named Poggin. He joins the group on their quest to banish the Calormenes. On the way, Farsight the eagle appears and delivers the grave news that Cair Paravel, the royal castle, had fallen and Roonwit the centaur was dead. King Tirian gathers Narnians to help fight the Calormenes, and the seven friends of Narnia and Aslan appear to aid them. Aslan awakens Father Time and changes Narnia forever. I think that the book is a great book. The book is written in a style that reminds me of a wise, old man telling a legend to his grandchildren, which adds to the tone of the story. I enjoyed the fantasy of the book and the many different characters. Jill is a young girl who is adventurous and stubborn, and Eustace is a boy with courage and some amounts of heroism. King Tirian is expectedly very noble and honorable, as shown when he felt shame for slaying two Calormenes. The best part of the book happens when Aslan awakens Father Time and changes Narnia forever. I was thrown off by the wording of some of the sentences occasionally, and I had to read those sentences multiple times to understand them. The plot of the book is also more difficult to understand if the reader has not read the previous books. I would recommend this book for all ages, however the reading level is suited for the ages of eight to twelve. I would rate this book eight out of ten stars. 1. Why does Puzzle the donkey follow the orders of Shift the ape? 1a. He thought that Shift was far cleverer than himself and thought it was kind for Shift to even be friends with him at all. 2. What does Puzzle find in the Caldron Pool? 2a. Puzzle finds a lion skin that he uses to dress up as Aslan the lion. 3. Why did the dryad seek King Tirian’s help? 3a. The trees and homes of the dryads of Lantern Waste were being cut down. 4. Who comes to help King Tirian after he is captured? 4a. Eustace Scrubb and Jill Pole arrive to help him. 5. What does King Tirian, Eustace, and Jill do after finding shelter and supplies? 5a. They agree to go rescue Jewel the Unicorn, Tirian’s steed. 6. What does Jill discover in the stable? 7. How does King Tirian free the dwarves? 7a. He reveals that Puzzle was disguised as Aslan and kills a fet Calormenes to free the dwarves. 8. Why didn’t King Tirian go back to Stable Hill to calm his subjects? 8a. He feared that if the dwarves doubted him, the animals might not believe him when he said that Puzzle was posing as Aslan. 9. What news did Farsight the eagle bring to King Tirian? 9a. Cair Paravel had been taken by the Calormenes, and Roonwit the centaur had been killed. 10. How did Shift reinforce the lie that he made? 10a. He added some truth to the lie by saying that Puzzle had pretended to be Aslan and that Aslan was angry. 11. Why did Tash suddenly disappear? 11a. One of the seven friends of Narnia commanded him to go away. 12. Why didn’t Queen Susan fo back to Narnia? 12a. She chose to “grow up” and put Narnia in the past. 13. How did Aslan destroy Narnia? 14. What is the new land like? 14a. Everyone from all times and places in Narnia are alive and well, and everything is more vibrant and vivid. 15. What does everyone discover about the new Shadowlands? 15a. All countries are connected, and the shadowland is the real version of the world.